Citation: Raouf MA, Kobayashi MF, AbdEl-Aal ABM, et al. Novel Bioabsorbable Bovine Derived Atelo-Collagen Type I Membrane: Characterization into Host Tissues. Periodon Prosthodon. 2017, 3:1. Copyright: © 2017 Raouf MA, et al. This is an open-access article distributed under the terms of the Creative Commons Attribution License, which permits unrestricted use, distribution, and reproduction in any medium, provided the original author and source are credited. In the 1950s, Hurley et al. described guided tissue regeneration (GTR) for the first time when he separated soft tissues from active bone areas with a barrier membrane around the spine . GTR was later adapted in the field of periodontology to guide tissue regeneration in the periodontium in cases where large periodontal lesions (intrabony defects). Subsequently, these principles were introduced in 1990 by Buser et al. providing generation of newly formed bone for dental implants by inserting a barrier membrane in a pure bone defect site . Both GTR and GBR techniques rely on their space maintenance ability and often defects are filled with a bone grafting material. In such cases, the main role of the barrier membrane is to prevent migration of the undesirable epithelial layer into the bone defect area , consequently permitting new bone and periodontal ligament regeneration . Ideal properties of barrier membranes have since been defined in the literature which should fulfill various fundamental functions such as ideal biocompatibility, biodegradability, provide cell occlusiveness, space maintenance ability, mechanical strength, and good integration into host tissues [5-7]. With respect to categorizing GTR and GBR membranes, they are generally divided into either resorbable or non-resorbable categories. The non-resorbable membranes include expanded polytetrafluoraethylene membranes (e-PTFE, Gore-Tex®), highdensity polytetrafluoraethylene membranes (d-PTFE), titanium-reinforced high-density polytetrafluoraethylene membranes (Ti-d-PTFE) and titanium mesh membranes (Timesh) . While PTFE membranes were utilized heavily in the early 90s, their usage gradually decreased as a result for the need of a second surgical procedure to remove the membrane thereby exposing them to an increased chance for wound infection and subsequent tissue regeneration [9-11]. Therefore, non-resorbable barrier membranes have since been more heavily utilized to avoid the necessity of a second surgery and non-resorbable membranes (typically Ti-mesh or Ti-d-PTFE) are utilized when space maintenance is primordial (such as for large vertical augmentation procedures). There are two broad types of resorbable membranes: natural and synthetic membranes . The natural membranes are based on natural materials including collagen and chitosan, and are typically derived from either human skin, bovine achilles tendon or porcine skin, whereas synthetic membranes mainly consist of polyesters e.g., poly (L-lactide-co-glycolide) (PLGA) and poly (L-lactide) (PLLA) co-polymers [13,14]. The advantages of bioresorbable membranes are: (1) their single step surgical procedure; (2) they are radiolucent; (3) their resorption allows timely new bone regeneration; and (4) their volume and shape of regenerated bone can be prefabricated. Nevertheless, the search for the ‘‘ideal’’ replacement barrier membrane is still being investigated . Absorbable collagen membranes are used most frequently in dentistry for GBR procedures due to their perceived advantages including their good biodegradation without eliciting a major immune reaction or foreign body reaction, ideal tissue integration, rapid vascularization, and hemostatic properties [16-19]. The aim of this study was to characterize a recently developed novel atelo-collagen type I membrane for GTR and GBR procedures. Firstly, investigation of the surface characteristics of a recently developed novel bioabsorbable bovine atelo-collagen type I membrane (BBAM) was performed. Thereafter, the biodegradability and immune response of this membrane after implantation in gastrocnemius muscle of a rat model was investigated. Bioabsorbable bovine-derived atelo-collagen membrane (BBAM) containing atelo-collagen type I were processed utilizing atelopeptidation and lyophilization technologies modifying the collagen components within bone structure to non-immunogenic atelo-collagen preserving the natural properties of collagen (ImploSorb, Bioimplon, Giessen, Germany). The collagen barrier membrane was visualized at various magnifications using scanning electron microscopy (SEM) as previously described [20,21]. This study was carried out on six female Wistar rats (mean body weight, 200 g). Animal handling and surgical procedures were conducted in accordance with the policies for animal care and use committee of Wuhan University, People’s Republic of China, and approved by the Ethics Committee at the School of Dentistry. All animals were fed food and water ad libitum and housed with constant temperature at 20-25°. All operations were carried out under complete aseptic conditions with a gentle surgical technique. For surgery, the rats were generally anesthetized with intraperitoneal injections of chloral hydrate (10%, 4 ml/kg body weight). After disinfection of the skin, bilateral muscle pouches were made in the gastrocnemius muscle of each animal as previously described . Subsequently, BBAM (ImploSorb, Bioimplon, Germany) was implanted intramuscularly and incisions were sutured in two layers. Postoperatively, a single intramuscular dose of penicillin (400,000 IU/ml, 0.1 ml/kg) was injected. After 4 weeks post-implantation, rats were sacrificed and samples were prepared for histological analysis. The samples were fixed in 4% formaldehyde for 24 hours at room temperature. The samples were then dehydrated in a series of graded concentrations of ethanol from 30% to 95% and were then embedded in paraffin as previously described [23,24]. The samples were cut into 5 μm thick sections and stained with hematoxylin and eosin (H and E) (Sigma, St. Louis, MO, USA) and Masson’s Trichrome according to the manufacturer’s protocol to visualize the immune response of the scaffolds within host tissues. In a first set of experiments, characterization of the surface properties of BBAM was carried out using SEM at various magnifications. It was first found that differences between the upper layer (in contact with the epithelial layer) and lower layer (in contact with bone) were observed at low magnification (Figures 1 and 2). The layer in contact with the epithelial tended to appear much more dense and smoother (Figure 1) when compared to the lower surface in contact with bone (Figure 2) when observed at either high or low magnification. Furthermore, the cross-sectional analysis (Figure 3) of these membranes also demonstrated differences between both layers. 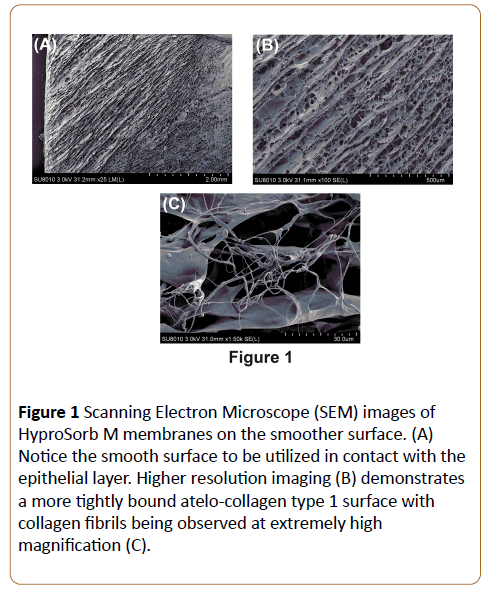 Higher magnifications demonstrated atelo-collagen type I fibers throughout the material surface with much surface roughness caused by these filament-like structures (Figures 1-3). Visible pores on the material surface were also seen as a result of the random fibrillary-structure of the atelo-collagen type I proteins. Figure 1: Scanning Electron Microscope (SEM) images of HyproSorb M membranes on the smoother surface. (A) Notice the smooth surface to be utilized in contact with the epithelial layer. Higher resolution imaging (B) demonstrates a more tightly bound atelo-collagen type 1 surface with collagen fibrils being observed at extremely high magnification (C). Figure 2: Scanning Electron Microscope (SEM) images of HyproSorb M membranes on the rougher surface. (A) Notice the rough surface to be utilized in contact with the bone layer. 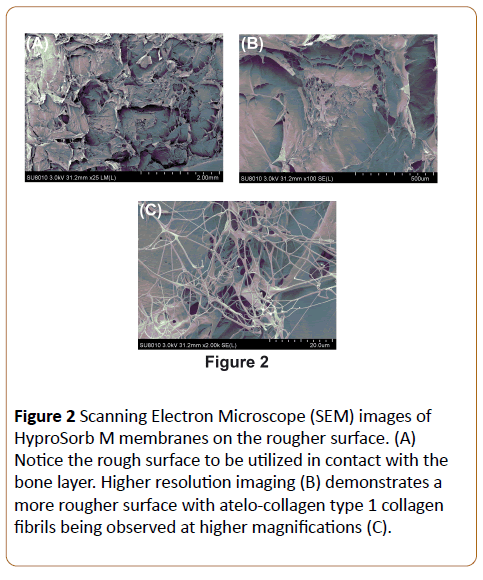 Higher resolution imaging (B) demonstrates a more rougher surface with atelo-collagen type 1 collagen fibrils being observed at higher magnifications (C). 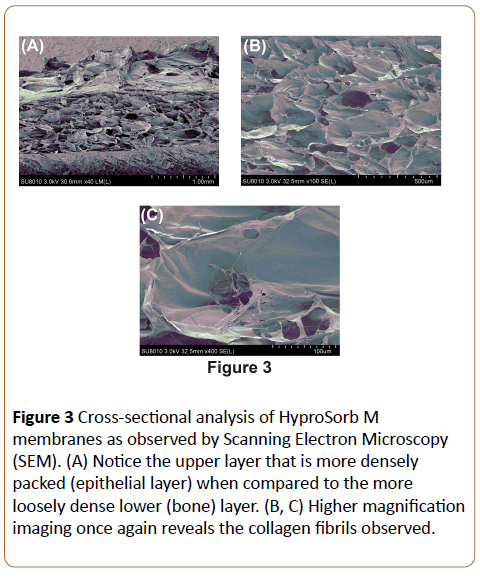 Figure 3: Cross-sectional analysis of HyproSorb M membranes as observed by Scanning Electron Microscopy (SEM). (A) Notice the upper layer that is more densely packed (epithelial layer) when compared to the more loosely dense lower (bone) layer. (B, C) Higher magnification imaging once again reveals the collagen fibrils observed. Following SEM investigation, the BBAM membranes were implanted into the gastrocnemius muscle of rats and observed response in surrounding host tissue at 4 weeks (Figure 4). All animals healed normally with no signs of infection and inflammation. The implanted BBAM scaffolds were gradually resorbed without any signs of an immune reaction. Macrophages were responsible for the degradation of the implanted materials without presence of foreign body giant cells or a foreign body reaction. The new vascular tissues invaded the implant membrane. Figure 4: H and E staining of atelo-collagen type I membranes placed in the gastrocnemius muscle of rats at both 10X (bar=100 μm) and 40X (bar=20 μm) magnifications. 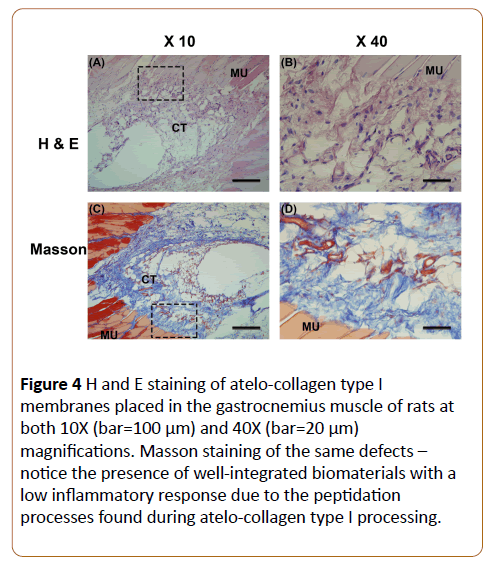 Masson staining of the same defects – notice the presence of well-integrated biomaterials with a low inflammatory response due to the peptidation processes found during atelo-collagen type I processing. The aim of the present study was to investigate a novel barrier membrane fabricated from atelo-collagen type I (BBAM, ImploSorb®) for GTR and GBR procedures. In spite of non-resorbable membranes such as e-PTFE being utilized as a standard material for GTR and GBR many years ago due to their strength and space-making potential, a second surgical procedure with susceptible wound infection and additional morbidity necessitated alternatives . For these reasons, bioabsorbable membranes were introduced with xenograftderived collagen being most commonly utilized [26,27]. Natural materials possess the added advantage that they are highly biocompatible and have therefore received much attention as barrier membranes for GTR and GBR procedures . Collagen membranes have advantageous properties in comparison to other synthetic materials due to their inherent bioactivity, ability to present receptor-binding ligands to cells, susceptibility to cell-triggered proteolytic degradation and their natural remodeling characteristics . On the other hand, they have some reported drawbacks including their potential immunogenic response, possible disease transmission, and complexities associated with their purification. Collagen and chitosan are the most frequently utilized natural materials used for GTR and GBR studies . Collagen membranes, especially types I and III, have gained much attraction over the past decade due to their good tissue integration, biodegradation, weak immune reaction, biocompatibility, fast vascularization, hemostatic effect, cell recruitment and adhesion potential [31-35]. Several reports have highlighted the membrane’s ability to grade over a 4 weeks to a several month period. In spite of the excellent biocompatibility and cell affinity of native collagen membranes, some authors have reported risks during GTR and GBR applications such as too rapid biodegradation, low mechanical strength, and a potential loss of space-maintaining ability in humid conditions [36-38]. Various methods have therefore been introduced including the cross-linking of collagen to improve their biodegradability and mechanical stability. These modifications however have been associated with a compromise in their biocompatibility due to the chemical, physical and/or biological cross-linking methods utilized. Nevertheless, the cross-linking of collagen enhances their tensile strength and prolongs their degradation period in vivo. While collagen is still considered the optimal choice as a biomaterial for bioabsorbable membranes, recent modification in processing technologies have proposed newer formulations. Collagens are a family of proteins with a welldetermined triple helical configuration with collagen type I being most prevalent constituting approximately 25% of the body's total proteins and about 80% of proteins found in connective tissue . Collagens are continuously remodeled in the body by degradation and synthesis. Type I collagen is degraded by a specific enzyme, collagenase, and is typically resistant to other non-specific proteolytic degradation . Typically, collagen is a weak antigen and its antigenicity is due to the telopeptides found on their non-helical terminals. As a result, they may be removed by enzymes such as pepsin, to produce atelo-collagen which have been described in the literature as having even lower antigenicity and immunogenicity when compared to full length collagen . Over the past decade, atelocollagen has therefore been more frequently utilized due to the fact that telopeptide cleavage was responsible for the antigenic response and cleavage could highly attenuate the immune response to atelo-collagen derived biomaterials finding [22-24]. In the present study, the barrier membranes fabricated from atelo-collagen type I were first characterized by scanning electron microscopy to investigate their surface morphology. It was found that BBAM demonstrated a topography with many visible collagen fibrils found on the material surface (Figure 1-3). It is well known that these visible collagen fibers support mesenchymal cell adhesion to biomaterials through a variety of RGD binding domains through their presenting fibronectin proteins. Since BBAM contains visible collagen fibrils, it is hypothesized that these scaffolds will better support faster cell attachment and GTR and GBR principles at earlier time points. Previously our group has shown that cells attach and proliferate faster on atelo-collagen incorporated bovinederived bone grafts when compared to bovine bone grafts without any form of collagen. This previous pre-clinical in vitro study supports the fact that atelo-collagen improves the regenerative potential of bone biomaterials via faster cellular processes including cell attachment and proliferation. Furthermore, growth factors (either from the surrounding media or via recombinant sources) attach and adsorb faster to collagen-containing bone grafting materials. The combination of these advantages highlight the use of atelo-collagen incorporation into either bone grafts or barrier membranes. Furthermore, another added advantage is that atelo-collagen can thereafter be utilized in several shapes and sizes depending on the fabrication procedures. Currently, the available options of atelo-collagen are therefore created in various shapes, sizes and thicknesses in order to meet the demand of the clinical defects presented. Thereafter, novel atelo-collagen membranes (BBMA) were implanted into the gastrocnemius muscle of rats to investigate their immune reaction and biodegradability over a 4 week period. It was observed that after a healing period of 4 weeks, the BBAM membranes were gradually resorbed without any signs of immunogenicity. The grafts presented with several macrophages responsible for the degradation of the material without showing signs of foreign body giant cells or a foreign body reaction. Furthermore, vascularization took place around the barrier membranes. Based on these findings demonstrating excellent biocompatibility of these BBAM, future research is now needed to compare atelo-collagen type 1 membranes to leading barrier membranes in the dental field alone or in combination with bone grafting materials for bone augmentation procedures. The results from this study show for the first time the biodegradability of novel atelo-collagen type I membranes (BBAM) when implanted into an animal model. It was found that atelo-collagen membranes were partially degraded at 4 weeks post-implantation in the gastrocnemius muscle of the rats. Future comparative and large animal models are now necessary to investigate the GTR and GBR principles of BBAM in comparison to other leading barrier membranes commonly utilized in dentistry. Beck K, Brodsky B (1998) Supercoiled protein motifs: The collagen triple-helix and the α-helical coiled coil. Journal of structural biology 122: 17-29. Benic GI, Hämmerle CH (2014) Horizontal bone augmentation by means of guided bone regeneration. Periodontology 66: 13-40. Buser D, Warrer K, Karring T (1990) Formation of a periodontal ligament around titanium implants. Journal of periodontology 61: 597-601. Cooperman L, Michaeli D (1984a) The immunogenicity of injectable collagen. I. A 1-year prospective study. Journal of the American Academy of Dermatology 10: 638-646. Cooperman L, Michaeli D (1984b) The immunogenicity of injectable collagen. Ii. A retrospective review of seventy-two tested and treated patients. Journal of the American Academy of Dermatology 10: 647-651. Davison PF, Levine L, Drake MP, Rubin A, Bump S (1967) The serologic specificity of tropocollagen telopeptides. Journal of Experimental Medicine 126: 331-346. De Souza SJ, Pereira HM, Jacchieri S, Brentani RR (1996) Collagen/collagenase interaction: Does the enzyme mimic the conformation of its own substrate? The FASEB journal 10: 927-930. Dimitriou R, Mataliotakis GI, Calori GM, Giannoudis PV (2012) The role of barrier membranes for guided bone regeneration and restoration of large bone defects: Current experimental and clinical evidence. BMC medicine 10: 81. Fernandes LL, Resende CX, Tavares DS, Soares GA, Castro LO, et al. (2011) Cytocompatibility of chitosan and collagen-chitosan scaffolds for tissue engineering. Polimeros 21: 1-6. Ferreira AM, Gentile P, Chiono V, Ciardelli G (2012) Collagen for bone tissue regeneration. Acta biomaterialia 8: 3191-3200. Fujioka-Kobayashi M, Schaller B, Saulacic N, Zhang Y, Miron RJ (2016) Growth factor delivery of bmp9 using a novel natural bovine bone graft with integrated atelo-collagen type i: Biosynthesis, characterization, and cell behavior. Journal of biomedical materials research 105: 408-418. Furthmayr H, Beil W, Timpl R (1971) Different antigenic determinants in the polypeptide chains of human collagen. FEBS letters 12: 341-344. Gentile P, Chiono V, TondaÃ¢ÂÂTuro C, Ferreira AM, Ciardelli G (2011) Polymeric membranes for guided bone regeneration. Biotechnology Journal 6: 1187-1197. Gher ME, Quintero G, Assad D, Monaco E, Richardson A (1994) Bone grafting and guided bone regeneration for immediate dental implants in humans. Journal of periodontology 65: 881-891. Gielkens P, Schortinghuis J, De Jong J, Paans A, Ruben J, et al. (2008a) The influence of barrier membranes on autologous bone grafts. Journal of dental research 87: 1048-1052. Gielkens PF, Schortinghuis J, De Jong JR, Raghoebar GM, Stegenga B, et al. (2008b) Vivosorb®, bioÃ¢ÂÂgide®, and goreÃ¢ÂÂtex® as barrier membranes in rat mandibular defects: An evaluation by microradiography and microÃ¢ÂÂct. Clinical oral implants research 19: 516-521. Hurley LA, Stinchfield FE, Bassett CAL, Lyon WH (1959) The role of soft tissues in osteogenesis: An experimental study of canine spine fusions. JBJS 41: 1243-1266. Klinger A, Asad R, Shapira L, Zubery Y (2010) In vivo degradation of collagen barrier membranes exposed to the oral cavity. Clinical oral implants research 21: 873-876. Kozlovsky A, Aboodi G, Moses O, Tal H, Artzi Z, et al. (2009) BioÃ¢ÂÂdegradation of a resorbable collagen membrane (bioÃ¢ÂÂgide®) applied in a doubleÃ¢ÂÂlayer technique in rats. Clinical oral implants research 20: 1116-1123. Machtei EE (2001) The effect of membrane exposure on the outcome of regenerative procedures in humans: A meta-analysis. Journal of periodontology 72: 512-516. McAllister BS, Haghighat K, Gonshor A (2009) Histologic evaluation of a stem cell–based sinus-augmentation procedure. Journal of periodontology 80: 679-686. Miron RJ, Gruber R, Hedbom E, Saulacic N, Zhang Y, et al. (2013) Impact of bone harvesting techniques on cell viability and the release of growth factors of autografts. Clinical implant dentistry and related research 15: 481-489. Miron RJ, Hedbom E, Saulacic N, Zhang Y, Sculean A, et al. (2011) Osteogenic potential of autogenous bone grafts harvested with four different surgical techniques. Journal of dental research 90: 1428-1433. Neel EAA, Bozec L, Knowles JC, Syed O, Mudera V, et al. (2013) Collagen—emerging collagen based therapies hit the patient. Advanced drug delivery reviews 65: 429-456. Owens KW, Yukna RA (2001) Collagen membrane resorption in dogs: A comparative study. Implant dentistry 10: 49-58. Pontz B, Meigel W, Rauterberg J, Kühn K (1970) Localization of two species specific antigenic determinants on the peptide chains of calf skin collagen. European Journal of Biochemistry 16: 50-54. Rakhmatia YD, Ayukawa Y, Furuhashi A, Koyano K (2013) Current barrier membranes: Titanium mesh and other membranes for guided bone regeneration in dental applications. 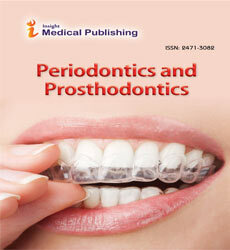 Journal of prosthodontic research 57: 3-14. Rothamel D, Schwarz F, Fienitz T, Smeets R, Dreiseidler T, et al. (2012) Biocompatibility and biodegradation of a native porcine pericardium membrane: Results of in vitro and in vivo examinations. International Journal of Oral and Maxillofacial Implants 27: 146. Schmitt F, Levine L, Drake M, Rubin A, Pfahl D, et al. (1964) The antigenicity of tropocollagen. Proceedings of the National Academy of Sciences 51: 493-497. Sowmya S, Bumgardener JD, Chennazhi KP, Nair SV, Jayakumar R (2013) Role of nanostructured biopolymers and bioceramics in enamel, dentin and periodontal tissue regeneration. Progress in Polymer Science 38: 1748-1772. Thoma DS, Villar CC, Cochran DL, Hämmerle CH, Jung RE (2012) Tissue integration of collagenÃ¢ÂÂbased matrices: An experimental study in mice. Clinical oral implants research 23: 1333-1339. Wei L, Miron RJ, Shi B, Zhang Y (2015) Osteoinductive and osteopromotive variability among different demineralized bone allografts. Clinical implant dentistry and related research 17: 533-542. Zhang Y, Wu C, Luo T, Li S, Cheng X, et al. (2012) Synthesis and inflammatory response of a novel silk fibroin scaffold containing bmp7 adenovirus for bone regeneration. Bone 51: 704-713. Zhang Y, Yang S, Zhou W, Fu H, Qian L, et al. (2016) Addition of a synthetically fabricated osteoinductive biphasic calcium phosphate bone graft to bmp2 improves new bone formation. Clinical implant dentistry and related research 18: 1238-1247. Zhang Y, Zhang X, Shi B, Miron R (2013) Membranes for guided tissue and bone regeneration. Annals of Oral & Maxillofacial Surgery 1: 10. Zupancic S, Kocbek P, Baumgartner S, Kristl J (2015) Contribution of nanotechnology to improved treatment of periodontal disease. Current pharmaceutical design 21: 3257-3271.